Many, many people are undertaking the arduous task of reducing and eliminating psychiatric medications and rebuilding their lives. Others are experiencing mental health challenges for the first time and are trying to figure out what to do. In the past 25 years. I have talked to lots of people about how they have recovered and moved past “mental illness”. In this article, I want to give you a synopsis of what I have learned from these people, and what I learned myself as I left medications behind and moved on to a rich and full life. In my early studies, I found that there were five Key Concepts that are essential to recovery. These concepts have stood the test of time. Hope. This is a critical attitude. You must believe that you can recover. You can develop an attitude of hope by reading stories from people who have recovered, spending time with people who are hopeful, and staying away from people who give you dire predictions about your future and your ability to get well. can recover for you. You have to decide you want to recover and then do whatever it takes to recover. You may have to “push” yourself, doing things that support your wellness even when you don’t feel like it. You are worth it. Education. We are smart people. We can educate ourselves. And we need to educate ourselves to make good decisions in our own behalf. I began realizing that I had to get off the psychiatric medications and heal myself after reading books like Peter Breggin’s Toxic Psychiatry ( 1991. New York: St. Martin’s Press) and Ty Colbert’s Broken Brains and Wounded Hearts (1996 Santa Anna, CA: Kevco Publishing) These days with the internet and lots of new writings, like Robert Whitaker’s Anatomy of an Epidemic 2010, New York: Random House) and my books on self help and WRAP®, and on-line information on all the medications, you can figure things out for yourself. If you can find good supporters and health care providers to assist you, that is even better. Self Advocacy. Advocate for yourself to get what it is you need and want for your self. I remember when I learned about thyroid problems and lithium, and wanted to get a complete battery of thyroid tests. I had to ask my doctor over and over again. He kept telling me the reasons this couldn’t happen and why it wasn’t necessary. I ignoredhim and just kept repeating clearly, “I need a complete battery of thyroid test”. Finally he ordered the test. My thyroid function was very poor. And I felt much, much better after I began taking thyroid replacement hormone. Support. Develop a strong team of supporters to listen to you, affirm and validate you and your experience, remind you of what a valuable person you are and help you problem solve. Support groups of all kinds are good places to meet possible supporters. In-depth descriptions of these concepts and how to implement them in your own life are included in WRAP Plus (Copeland, 2011, Dummerston, VT: Peach Press). 2. Develop a Wellness Recovery Action Plan® and use it intensively so that using it is “second nature” before you try and reduce your medications. If you are just beginning to deal with mental health issues in your life, WRAP® is your best first step to recovery and wellness. WRAP was developed by a group of people I was working with, people who live with mental health issues every day. As soon as we finished developing WRAP, I wrote one for myself. It was a giant step forward for me in my own recovery. I use it every day. It is a simple, safe, evidence-based, voluntary system for organizing and using your personal wellness strategies. It is used extensively around the world. You can learn more about WRAP® at www.mentalhealthrecovery.com, in WRAP Plus or in one of the many other resources available through the website. Although there are many ways to learn how to develop a WRAP, the best way to develop an effective and powerful WRAP is by attending a WRAP group. You can find out about WRAP groups in your area by contacting your local mental health agency or by contacting the Copeland Center for Wellness and Recovery at www.copelandcenter.com. 3. The following Values and Ethics were, like WRAP®, developed by people who have a lived experience of mental health challenges. Use them as your guide to your own thinking, and in choosing treatment, assistance and support as you work on your recovery, and in all of your life. A. There is hope. People with mental health issues get well, stay well, and do the things they want to do with their lives and you will too. B. Self-determination, personal responsibility, empowerment, and self-advocacy are essential to recovery. C. Insist that you are treated as an equal, with dignity, compassion, mutual respect, and unconditional high regard; as a unique, special individual, including acceptance of diversity with relation to culture, ethnicity, language, religion, race, gender, age, disability, sexual identity, and “readiness” issues, and treat others the same way. D. Understand that there are “no limits” to your recovery. If people tell you there are limits, let them know you don’t appreciate that kind of input, and then associate with people who accept that there are no limits to recovery. E. Every aspect of your recovery is voluntary. Decide for yourself what you are going to do and how you are going to do it. Don’t allow yourself to be forced to do anything. It doesn’t help and makes things worse. All programs you are involved in, including WRAP, need to be totally voluntary. F. Know that you are the expert on yourself and expect others to understand that. Use that expertise to make good decisions and take positive action in your own behalf. G. Focus on your personal strengths and away from perceived deficits as determined by you or others. H. Avoid the use of clinical, medical, and diagnostic language. If possible, work with peers, to increase mutual understanding, knowledge, and promote wellness. I. Emphasize wellness strategies that are simple, safe and non-invasive like creative arts, music and meditation. J. Understand that the difficult feelings and behaviors you experience are normal responses to traumatic circumstances, and that what is happening in your life should not be considered “symptoms of anything” or a “diagnosis”. Validation of your experiences by people you respect, consistent support and doing what you know you need to do to take care of yourself will facilitate your healing. Again, this is a synopsis. Make copies of this document, keep it handy and review it every so often to make sure you are on the right track. 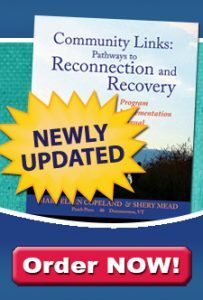 Learn more at www.mentalhealthrecovery.com, by using one of the WRAP and Recovery resources and by attending a WRAP group. These concepts, WRAP® and Values and Ethics are supporting people everywhere as they recover and move on with their lives.